20 Neon Fluorescent Yellow Full-Page Laser Labels 8.5" x 11"
Designed for use in Laser Printers Only! This package contains 20 Sheets of 8.5” x 11” Rectangular Full Sheet Permanent Adhesive Neon Yellow Labels. There is 1 Label per page for a total of 20 labels per package and are for use in Laser Printers only. The layout matches all common full sheet or full-page label templates such as the Avery® 5165, Compulabel® 313356, Uline® S-5045, Online Labels® OL175 and our downloadable template 850110. 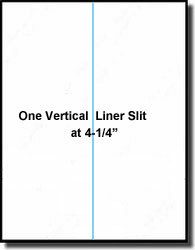 This label comes with one single vertical back-slit liner. If you have any questions about this product, please do not hesitate to ask us!